Mon Soleil - Beautiful Home Directly on French Leave Beach! Discounts for September and October! Rollback to $1600 per week! Step off the patio and you are on a beautiful pink sand beach. Our home, beautifully landscaped by our gardener with coconut palms, colorful hibiscus and native plants, offers a spectacular view of the Atlantic Ocean. Featuring two bedrooms and a loft, cathedral ceilings in the great room, and a library, the windows covering the entire front give an unobstructed view of the turquoise water and pink sand beach. Our caretakers, Edgar and Doreen, will assure that our home is ready for your visit. Edgar can also arrange for transportation from the airport and for a rental car. Maid service is also available. Located just one mile from Governor's Harbour, groceries, fishing supplies, and shopping are easily accessible. Governor's Harbour is the center of Eleuthera so you will be able to find anything you will need. Eleuthera, rated by Fodor's Travel Guide as one of the most beautiful of the Bahama islands, is waiting to be explored. You will find quaint villages, where the natives are eager to greet you with a wave and a smile. Talk with the natives and learn all about the island. There are miles of secluded and deserted pink sand beaches where you can swim and snorkel in the spectacular crystal clear turquoise water, which averages 70 to 80 degrees. Beautiful coral reefs are right off the beaches where you will see many colorful tropical fish. While relaxing on the beaches, bask in the sunlight, feel the refreshing ocean breeze, and watch the gentle waves. Walk the beaches and find that perfect shell. Eleuthera offers both world class bone fishing and deep sea fishing. For the adventurous there is a quarter mile long cave waiting to be explored. All of this is within one hour of Fort Lauderdale, West Palm Beach, and Miami, which offers direct flights. Located directly on French Leave Beach! The home was nice. Very close to the beach. We enjoyed kayaking and snorkeling right out front of the house. You are close to Governors Harbour however you really need a rental car if you plan to dine out and explore the island. We rented a car from Edgar the caretaker. I have rented from Beth and Jim for over 15 years.This comfortable airy beach house is perfect for a relaxing holiday on an uncrowded beach in the Bahamas Family Islands. 5 Minutes from renown Tippys Restaurant and 10 minutes from Governors Harbour with full service grocery and liquor stores.Fresh fish is available daily at the waterfront.Caretakers Edgar and Doreen Gardiner will treat you like family in the gentle Bahamian way. If you want a casino ,entertainment and a full service resort this is not for you.If you want a comfortable,clean well appointed rental on a world renown beach with few people around this is for you. There are 5 houses on the entire beach and little traffic passing by. Treat yourself to warm Bahamian Hospitality in a totally safe environment. We rented this house for a week in January 2017. The house is located on a beautiful beach and only a mile or so from the town of Governor’s Harbor, perfect location. Beth the owner and Edgar the caretaker are wonderful and very easy to communicate with. The house itself is need of some repairs and updates. The refrigerator door was held together with duct tape, while two of the windows that face the ocean had blue duct tape across them that said “broken, do not open”. The seats on the kayaks were broken and tied on with rope, making them unusable as well as the Hammock, which had black mold all over it. The inside of the house needed a deep, thorough cleaning as there were layers of dust on everything from the stereo speakers to the shelves in the main bedroom. The throw rugs were filthy and the mattresses were on plywood frames instead of box springs. Anytime we wanted to use anything in the kitchen, we had to wash it first due to food being caked on the dishes/silverware, etc. This house could be absolutely stunning, but obviously it has been neglected over time, as the pictures on the VRBO website are outdated. We would not stay there again. We recently stayed at Mon Solieul in Governors Harbour-first 2 weeks of January 2017 and felt it was well overdue to comment on our stay.My wife and I have been making our winter vacation at Mon Solieul since the mid 80s.Our 4 kids started coming with us since the early 90s.Just a few days ago our family read a bad review and we felt is was appropriate to set the record straight .Our friends back home in Montreal, Canada have often asked why we return to the same house on the same island every year.We simply tell them that Mon Solieul is our little sancuary! !The house is located on French Leave Beach-widely regarded as the best beach in Eleuthera.For price ,privacy and comfortable living it offers the best package for us.In recent years there have been alot of houses being built all over the island.These houses are very nice-most of them not on the beach-are double and even triple the price and in our opinion dont offer the same value,charm and intimacy and view.The house offers breath taking views of the ocean with windows covering all the walls.To be honest we have never written a review because we wanted Mon Solieul to be our secret.When we arrived, the house was spotless with the windows and floor tiles sparking clean.The house offers an outdoor shower with a great view of the ocean.It also has 2 spacious decks with incredible views with plenty of chairs.It also has a nice hammock hung between 2 palm trees inches from the beach.The grounds are extremely well kept and the groundskeeper allways makes a point to prepare a couple of cocanuts for you to sample.We normally start our day with a kayak ride followed by a swim and a snorkel before having our breakfast on one of the decks.One of the islands best restaurants,Tippys is a 15 minute walk on the beach from our house.It is important to mention that the local fisherman finish their days work around 3.00pm each day just in front of Mon Solieul and we have the luxury of being offered the CATCH OF THE DAY first before they head of to town to sell it the restaurants.Our 2018 vacation at MonSolieul is allready booked and we cant wait!! We stayed at Mon Soleil for the first time after numerous trips to the island. It's a great home in a fantastic location. The owners were extremely nice and easy to work with. We highly recommend! Even though it has years since we came and stayed with my brother and his wife, the amazing memories make it seem like yesterday! I see a lot of cool updates to this cozy island retreat since we visited. The time we spent there wasn't long enough to enjoy that soft pink sands, virtually private beach. This is how you relax folks! 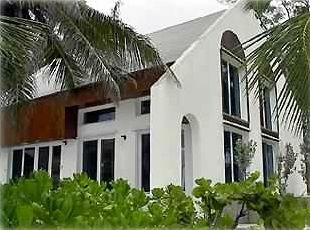 Mon Soleil is what inspired us to get our own vacation home in Florida in 2007! We've since moved from Missouri to Texas, where the winters are warmer! Our condo is for sale now and we've had a fabulous business renting it out thanks to you guys inspiring us. But we want to get back to vacationing at some other places, especially here. Hope to be your guests again sometime! Note: when I filled this out I tried to add the correct year we stayed, but it only goes back one year.